For the second time, we were very pleased to welcome Paul Jepson to talk at a ConSoc event. Paul explored ideas of how local and cultural practices contribute to conservation in ways that we might not necessarily expect. From his experiences out in Indonesia working on bird conservation, Paul highlighted the central theme of the evening: how relationships with nature can be very varied and specific to individual communities and cultures. Different ways of framing nature and species can provide paths to conservation that are much more successful than the archetypal fortress conservation and protected areas. 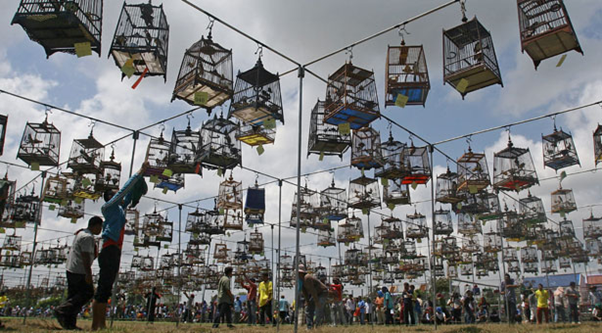 Bird song competitions in Indonesia captivate many people, and the culture of bird keeping and admiration for these animals provides a way to value nature and gain support for preserving native species. Engaging with local practice and perspectives on the environment can build influence in situations where the engagement of governmental or corporate bodies is absent. Shonil has carried out a great deal of research on the role played by cultural and spiritual values in conservation. He described the wealth of aesthetic, spiritual, psychological, and other non-material benefits people obtain from contact with nature. These ecosystem services can provide a strong incentive to protect natural habitats. And there are many places in the world where religious and spiritual practices are already protected important areas of habitats. 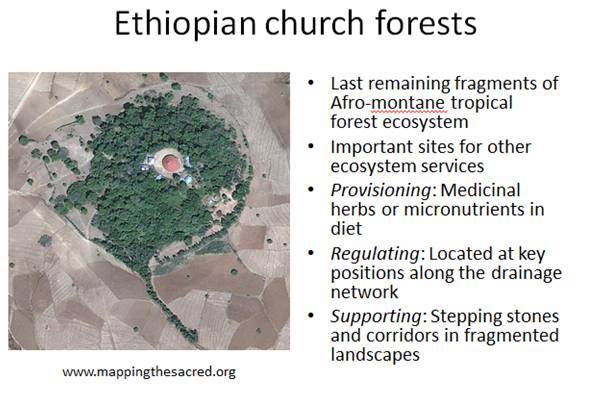 The Mapping the Sacred project is documenting the wealth of sacred groves across the world, each of which is an oasis of natural habitat in an otherwise rapidly changing landscape. The world of conservation has a lot to gain from interacting with faith groups, not only in terms of identifying incentives for people to conserve nature, but also interacting with a very strong communication network, and also in recognising the areas that are already protected by these important practices. In addition, Shonil also highlighted the importance of engaging with local practices to help manage local resources. In India, an invasive plant, Lantana, can be used to create baskets and other useful household products. By encouraging the use of this species for small-scale industry, and connecting with local values and markets, it may be possible to check the spread of Lantana. Ashley has carried out research in many parts of the world on how local beliefs and traditional practices have protected habitats and species. 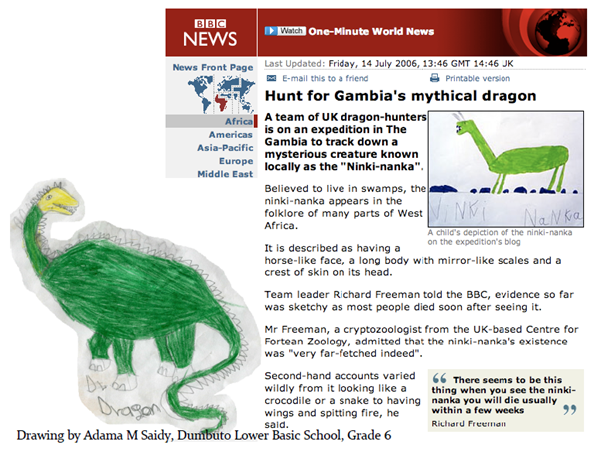 In the Gambia, West Africa, she has shown that beliefs in ninkinanko (supernatural dragons) result in the conservation of forest. The areas of forest where the dragons live are not entered by any local residents, and so the habitat remains undisturbed, with no extraction of wood or hunting. Ashley has carried out her PhD research in Sabah, Malaysian Borneo, also exploring how local beliefs and faith communities reinforce nature conservation practice. She described how kopizo (omens) of dancing animals preserve hilltop forests and watersheds, the presence of these spirits in the landscape thereby contributing to the maintenance of biodiverse tropical rainforest. In addition, Ashley described how the strong connections and political will of faith groups can provide the necessary influence to protect important natural resources. In Kudat, the loss of forested area on a key watershed was prevented by local groups coming together and campaigning against the conversion. Overall, it was another great evening exploring opportunities for conservation success in the coming decades. Thanks to all our speakers for their time and contribution to a brilliant event.